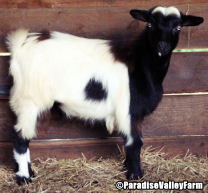 We have some amazing Silky Fainting Goats and encourage you to come see them. Our stock is friendly, disbudded, and have coats of varying lengths. We strive to breed colorful goats while also trying to add polled and blue eyes into our herd. Some prefer slightly shorter coats as they do not require the same upkeep.